Login to your Exhibitor Portal and click on Booth Personnel to register your staff. For password assistance, contact attendee Brittany.Spargo@spargoinc.com. For showcasing your products and services, the NIGP Products Exposition is the premier event for government suppliers. 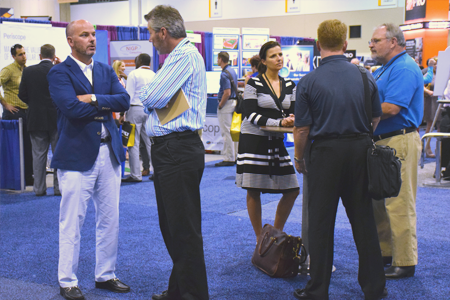 NIGP’s 2019 Forum and Products Exposition is the largest educational conference attended by government purchasing officials representing diverse agencies from the U.S. and Canada. This annual event draws over 1,000 procurement professionals each year. 90% are principle buying decision makers in their agencies. The Forum is an excellent opportunity for them to engage in professional development and to discover new products and services in the Products Exposition. Where is the Exhibitor Service Manual? The Exhibitor Service Manual will be available in May 2019. All exhibits must be set by 12:00 PM on Sunday, August 25. Please note: This schedule is subject to change. All exhibits must be staffed during exhibit hours. What is the demographic breakdown of attendees? Click here to view the 2019 Exhibitor Prospectus. Read more about what attendees said about the 2018 Forum here. A deadline checklist will be housed in the Exhibitor Service Manual. Most deadlines fall 30-45 days in advance of the first day of the Expo. The conference “Schedule at a Glance” may be referenced here. How can I register my booth personnel? Exhibitor Registration will open in Spring 2019. Once open, you may register your staff here. Your badge allotment is dependent on the size of your space. Standard Allotment: One full conference badge and two Exhibit Hall Only badges per 10’x10’ space. Book here. Reserve your room early at the special NIGP rate. Remember that your patronage at these hotels makes it possible for NIGP to honor its contractual obligations, thus keeping registration fees down. Be aware that it is not unusual for housing wholesalers to contact convention attendees claiming to offer great deals on hotels during the convention dates. Please be advised that NIGP has no affiliation with these room brokers and attendees opting for alternatives offered by these wholesalers may be at risk. Transportation to the Convention Center? The closest major airport to Austin, TX is Austin Bergstrom International Airport. This airport is 11 miles from the Austin Convention Center. What are the age restrictions at NIGP 2019? No one under age 18 is permitted in the exhibit hall during move in or move out hours. During exhibit hours, children will require a badge to access the exhibit hall. Please see registration for badge information. Business professional is always welcome, but khakis and company logo polo-shirt are acceptable. Visit our website to see a current list of exhibiting companies and an interactive floor plan. How do I work with a tight budget? Always bring back up supplies so you don’t have to rent them for a premium at the show. Meet your freight target times (if applicable) and instruct your drivers to check in at the marshaling yard before the deadline time noted in the service manual to avoid additional surcharges. Pricing may be found in the Exhibitor Service Manual which will be available in May 2019.